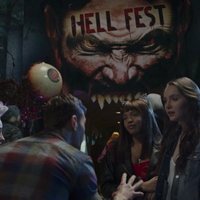 In 'Hell Fest', a group of friends decide to go to a new horror theme park, but a masked killer will turn that day into their biggest nightmare. While the murderer is killing and frightening every member of the group, an amount of patrons who are in the park that day believe it is all part of the spectacle, ignoring all these young group's suffering. This new horror movie, directed by Gregory Plotkin and starring Bex Taylor-Klaus, Reign Edwards, Christian James and Amy Forsyth will be released on September 28. The genre of the movie is the slasher, just like other really popular movies, such as 'Scream', 'Halloween', 'I know what you did last summer' or 'Happy Death Day'. This recreation park is waiting for you at the big screen on September 28. Write your own 'Hell Fest' review. Many of the characters waking around Hell Fest in the beginning are from Netherworld Haunted House in Georgia. Netherworld is in the top ten haunted attractions in the USA. The killer's mask was designed by Tony Gardner's Alterian, Inc., which also designed the mask for 'Happy Death Day' and 'Scream'. As a promotional material for the film, the production team designed a haunted house which the visitors can get really scare. The house can be visited during September 28 - October 31 2018 in Los Angeles, St. Louis and Chicago.